"Preparations for Pompey's 2010/11 season are already under way," read a statement on Portsmouth website. "The football club can confirm it has offered new contracts to James, Kanu, Hreidarsson and Rocha." The FA Cup runners-up were relegated from the Premier League and are £138m in debt. Administrator Andrew Andronikou said the club hoped to retain some of their first-team squad to give Pompey a "firm base" on which to build on during their new life in the Championship. James, 40 in the summer, has yet to confirm his plans following the World Cup, while 35-year-old Hreidarsson missed the end of the season and the FA Cup final with an Achilles injury. Keeping Rocha, 31, and Kanu, 33, would provide key experience to a squad hoping to return back to the Premier League at the first time of asking. On-loan players Jamie O'Hara and Aruna Dindane are set to return to their parent clubs Tottenham and Lens. But the club stated that they are hoping to retain the services of their young talent. "A number of Pompey's rising stars have also been approached with new deals to keep them at Fratton Park," the statement continued. "Lennard Sowah, Matt Ritchie and Joel Ward have all been offered contracts, following their impressive breakthroughs at the end of the season. "They are joined by fellow youngsters Marlon Pack and Tom Kilbey, along with reserve keeper Jon Stewart. 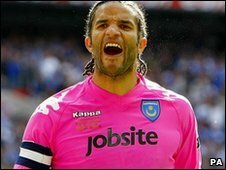 "Fratton favourite Linvoy Primus has also been offered a position at the club, following his retirement from football. "And Pompey's coaching staff have identified a number of players in different positions that they would like to bring into the squad, with work ongoing in this area." It added: "Angelos Basinas, Jamie Ashdown, Steve Finnan and OJ Koroma have all been released."